this week has been busy with a lot of cramming, crafting & christmas activities. i had my 3d art final tuesday morning at the crack of dawn.. at least thats what it felt like as i had to leave my house at 6:30 to be there at 7 a.m. & it was still pitch black outside. 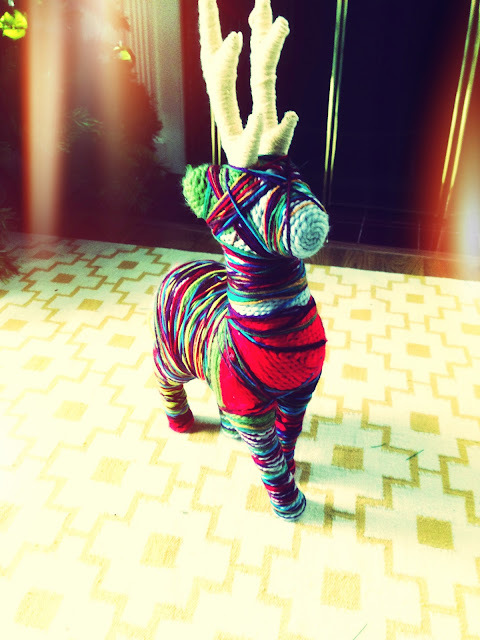 since my final was so early monday evening was saved for finishing up my final project: a reindeer wrapped in yarn. i got the idea from a decoration i saw of my moms & wanted, but couldn't buy... so i figured i'd have my attempt at making my own. it turned out different than what i had hoped for, but i think i like it. tuesday after our finals austin & i ran around doing errands before having our dinner group at our house. we weren't too interested in making dinner though & were planning to make gingerbread houses, so instead we ordered pizza! 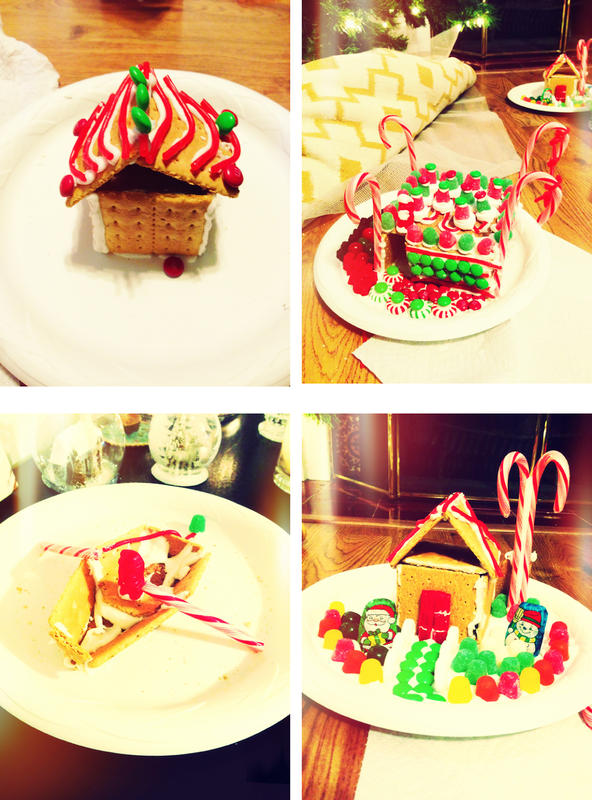 shayla, ashley, jake, austin & i all had our go at making gingerbread houses... & ashley, shayla & mine kept breaking & falling down. 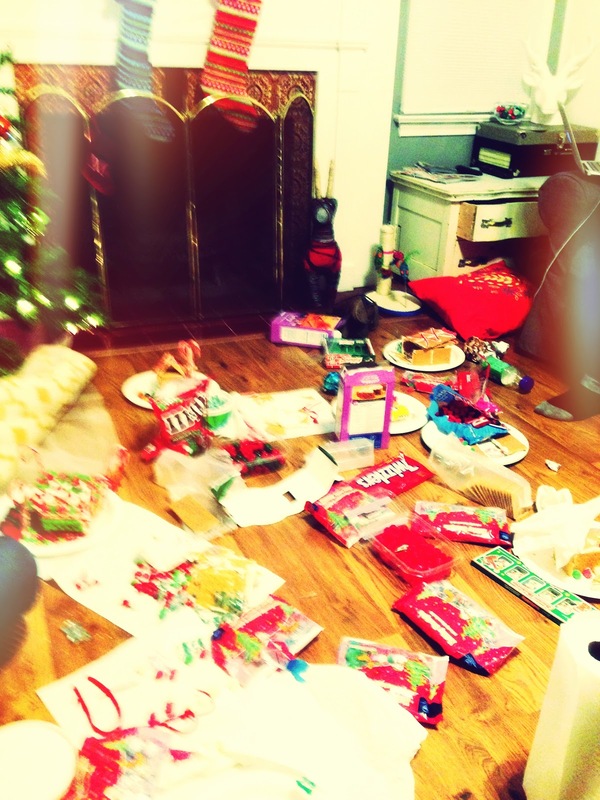 it was a bit of a disaster. but ashley & i eventually figured out a way to make it work for us. they were pretty fun to make! wednesday was spent at the library studying some more before going to austins parents house to have dinner & celebrate our christmas with them! i've really liked this exchanging christmas gifts before christmas... we've opened gifts for the past 2 weeks & it's great. i loved giving them their gifts too. 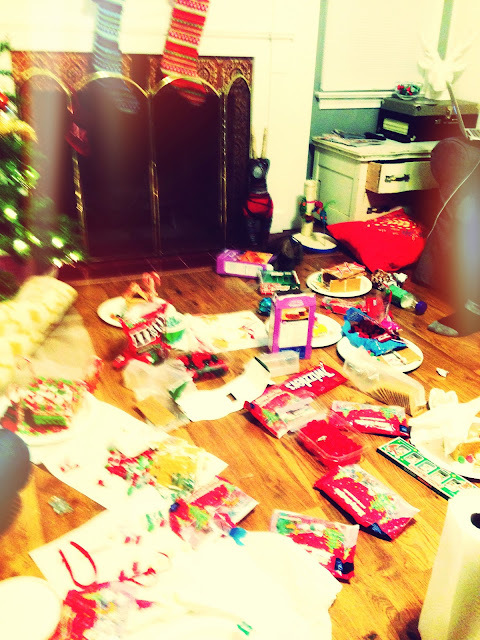 i think thats the best part of christmas, is giving the gifts. anyways.. austin got a snowboard pass & a shirt, we both got sleeping bags, an air mattress & a box full of children christmas books, i got a duffle bag i had been wanting, & all of the harry potter books in hard cover! i was so excited! on our way to his parents house, we stopped by a house they told us about that has their christmas lights go to music. i loooove houses that do this. i actually love any house that has lights, but i really love the ones that go all out. they are so fun & i love to watch them. so we went to watch it for a few minutes & it definitely did not disappoint! thursday were our laaaaast finals! it was great & i am now feeling so relieved. i'm so happy to be done until january. it's a greatly needed break. to celebrate finishing we tried a new mexican restaurant called Tortilla Bar. it was really really delicious. all of their food is organic & local, & they made their tacos with slices of apples which was new & pretty good. later that night we went to our friend danielle's birthday dinner & then back to her place for cupcakes & donuts!